The sleek waters of Lake Wilderness beckon vacationers either for a refreshing swim or shoving off for a row. The latter activity is exactly what Elaine Borell and Shirley Demko, students of Buckley Division, White River High School are enjoying.— Times photo by Royal Crooks. 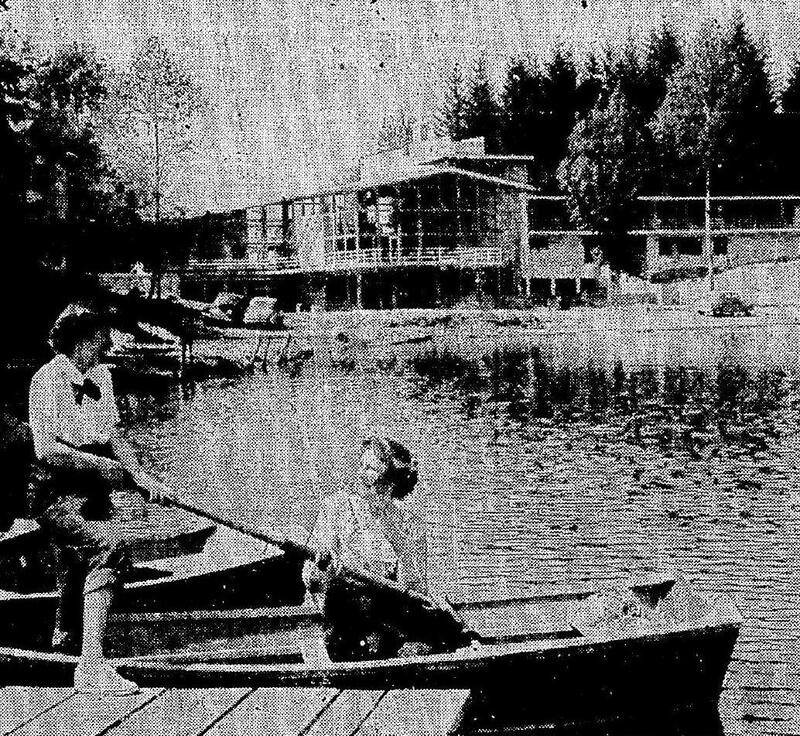 Newest of resort hotels within a few miles of Seattle is Lake Wilderness Lodge, scheduled for completion this month as an addition to Kain Gaffney’s large picnic park on the west shore of Lake Wilderness. An investment of $250,000 is represented in the hotel and landing field. The building, of modern design, has walls mainly of glass. Every room looks out upon the lake, with its wooded shore line and numerous boats. There are but 12 rooms for overnight guests, but large dinner groups will be welcome. The regular dining room has a seating capacity of 140; banquet rooms on the ground floor will accommodate 400 and catering will be geared to accommodate conventions. In order to use advantageously the sloping site on the shore, the lodge has been constructed on four floor levels, centered around a staircase of spectacular design, circling a mammoth totem pole, ax-carved by the sculptor, Dudley Carter. The huge timber is four feet in diameter and 30 feet from base to top, with designs its entire length. I recall many fun days at the resort and also many fun dances there.